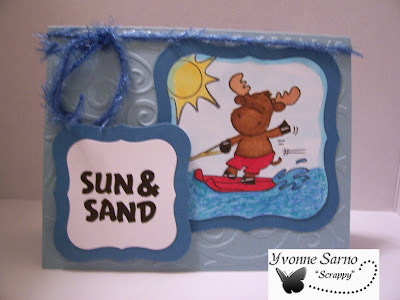 I worked these last two tags up for SuG's tag swap on Splitcoaststampers! Enjoy! I've been trying to fall asleep for a few hours to no avail! Anywho, I decided to post another tag I worked up for SuG's tag swap! It's very simple, but i think it's elegant and I like it alot! What about you? I cut the base from SU whisper white cs & rounded the edges before putting into my snowflake embossing folder and running it through my Cuttlebug. Next, I punched the whole and put the black eyelet into the top of the tag before adding the white, black, and silver ribbons. I stamped the snowflake (Inkadinkado) onto Georgia Pacific 110 cs using Memento tuxedo black ink, and cut it into a 1-1/2 inch square before rounding the corners. Then I mounted it on a 1-3/4 inch square of SU basic black cs which I'd also rounded the edges on. I affixed them together and put them onto my base using dimensionals. Finally I added a strip of Bazzill Bling cs to the back for stability and added the crystals and the crystal stickles (Ranger) to the image. Viola! 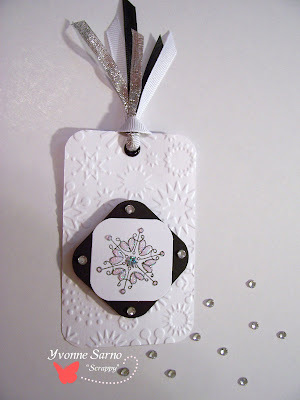 A nice, simple, yet elegant Holiday tag! Tags for Su G's swap on Splitcoast! I suppose I have gotta get hoppin' on my swappin'! I always have a huge amount of open swaps going on and now is no exception! I have somewhere over 50 open - some of which have multiple spots! So since I'm still on a creative spree, I don't want to lose any of my mojo! I'd better get to my stampin' area to play! 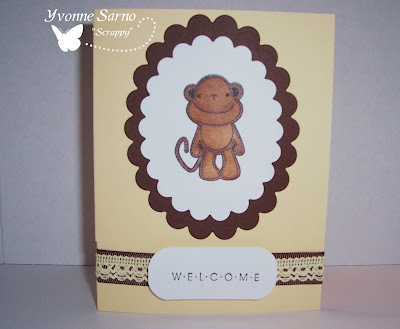 This cute little monkey comes from a clear stamp set by Sandy Lion. I stamped him using Memento tuxedo black ink on Georgia Pacific 110# cs, and colored him in with my Copics (E25, E35). I cut him out with my scalloped oval Nestabilities, and mated him atop another scallopped oval of SU Chocolate Chip. I used a strip of 5/8 inch SU Chocolate Chip grosgrain ribbon and put a piece of hand-crochetted pale yellow lace atop it. Then I laced them both through and around the base of the SU Barely Banana card. Finally, I added the sentiment (SU) by placing it atop dimensionals and centering it on the ribbon-lace. I love the way this card came out! It's perfect for welcoming a new baby into the family, or giving to the new teacher or aide in your childs preschool or kindergarten. It would also be great to welcome a family with small children into the neighborhood! Lisa is a fantastic host and a great friend! I'm so glad that she is local so we can occassionally get together for a 'stamping playdate' or lunch! This time Lisa is featuring cards with digital images designed by the uber talented Dustin Pike. Dustin seems like a wonderfully creative guy, and like me- is forever a kid at heart! He is also participating in the swap himself, so I cannot wait to see what he concocts. For this dragon card, I used a digi image printed on Georgia Pacific 110# cs. I colored in the green shaded parts of him with my Prismacolor Pencils (PC913, PC989) and blended it with Gamsol (OMS). I used a metallic silver Prismacolor Pencil (PC949) for his helmet. I used my Copics (YG91, R29, E49, W5) to color the rest of the image. I cut the image out using my Labels One Nestabilities, and mounted it on a second, larger diecut using SU Chocolate Chip cs. I stamped the sentiment (SU) using Memento tuxedo black in on a scrap of GP110, and punched it using SU's word window punch. The background DP is cut from the 2007 DCWV Christmas slab. I wrapped a piece of printed grosgrain ribbon from Dashes, Dots, and Checks to the DP and made a faux tie. I affixed everything to the SU Bashful Blue base and added two blue Dewdrops to the ends of the sentiment punchout to finish it. I stamped Changito with Memento tuxedo black ink on Georgia Pacific 110# cs, and colored him with my Copics (R29, E25,100). I cut him out using my Quickutz squares. I cut graduating squares of cs in SU Basic Black and Real Red and mounted the image atop them. I mounted it on a SU Glorious Green base and put 3 buttons across the bottom. I wanted a very simple layout and design, but I felt I needed to add some kind of sentiment. I found this one by Studio G to be a perfect fit. What do you think? Well my Hanna Bonanza is over, as is my bid for the guest designer spot for Hanna Stamps I was vying for. I'm disappointed of course, but it hasn't dulled my will to try again next time! I'm glad that Kristi and Vicki at Hanna Stamps offered the opportunity to try out and I will continue to ink up my Hanna's, Riley's, and Sophies to create many more cards and projects to come! I created this card tonight using the Hospital Hanna clear stamp set from Hanna Stamps! Her scrubs top and the wall behind her is paper pieced. I also used a different fold for the card and lightly distressed the edges too. You have to untie the bow to open the card. Every week I go in for my treatments at Duke and all the doctors and nurses have been great! The nurses are so kind and as gentle as possible and I really appreciate it! I've had several great nurses take care of me in the Chemo/Infusion suite. Each one proves to be more adept as the next at trying to keep me and all of the other patients as comfortable as possible. I know that I'm one of the lucky ones there -my cancer tests came back negative (Thank God!)! Many of the other patients are so much worse off than I am, but the level of skill, care and compassion never wavers. So I made this card to accompany the cookies I am baking to thank them. I know it is not nearly enough to repay them for everything they've done and continue to do. I will eventually be done with this series of treatments, but hopefully this will give them at least one bright moment at a very difficult job! Looks like Riley is having a great time waterskiing! Wish I was there enjoying it right along with him! The water looks so beautiful and the shimmer of the sun on the water is so inviting! 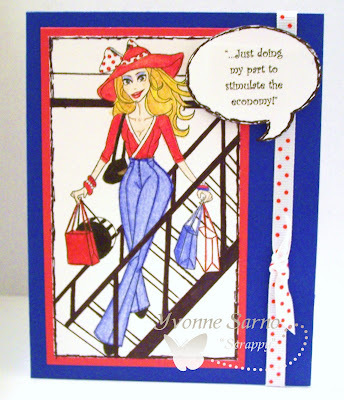 I made this card as an entry for Hanna Stamps Guest Designer call. It is such an apt card for alot of the brave men we have at war overseas! Kudos to our troops - they are our true HEROES! 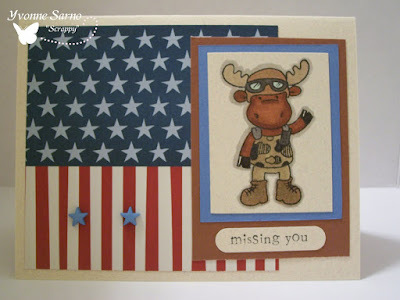 I used GI Jon Riley from Hanna Stamps with a sentiment by SU. I did my best to match the Copic colors I chose for Riley's fatigues to the Desert Camo the Army uses in the desert. (Copic colors: W-1, W-3, W-5, W-7, E-33, E-37, E-39, E-43, Y-28) The DP comes from Creative Imaginations, while the cs comes from Wausau, Bazzill, DCWV, and GP. This card reminds me of my BIL, John. It seems he can fix anything! I wouldn't at all be surprized to see him building a brick wall just like Mason Riley! Now, my BIL's birthday passed months ago, so I won't be using this card for him -unless I save it for next year. However; I'm sure this very masculine card would be perfect for most men...and the little boys who love trucks, and construction stuff! Meet Princess Sophie of Mooseville! My three year old daughter, Annabella is really into the whole princess thing right now. She is very strong minded, and loves to stamp, and do crafts right alongside me! So while I was choosing my next entry project for Hanna Stamps guest designer call, I was persuaded to make Annabella her own 'special Sophie cawd'! It's just too hard to ignore this face doncha think? I used Ballerina Sophie, stamped her with Memento Tuxedo Black ink on GP cs. I cut her out, & made her a matching dress & hennin (pointed, veiled hat). I colored her in with my Copics & sat her to the side. I took a castle background picture I found in the dollar store and colored it to match her. Then I blinged, glittered, stickled shimmer-misted, Spica-penned & sparkled the daylights out of the whole thing! I cut & pasted the castle segment to some SU Almost Amethyst cs. I attached Princess Sophie to the card with dimensionals to raise her off the card & her transformation into royalty was complete! Riley is takin' a wee break from harvesting the pumpkins! It must be really hard work! Good thing Riley's out there and waiting to harvest those pumpkins. Especially because like Sophie, I can't wait to make some fresh pumpkin pies! I made this card up for the Hanna Stamps Guest Designer call. It's another of several entries I've created, but my creativity is continuing to churn! So back to my stamping area I go, to create my next Riley, Sophie, or Hanna! What will I come up with next? You'll just have to watch and see! I can't wait to start! It's 9:30 am in the morning on a Saturday, so what am I up to? I raced my way through beginning the housework so I could get to my stamping area of course! I have a date with my creative side! For my Happy Christmoose card, I colored Tree Riley in with my Copics on Neenah Solar White before using a scalloped circle Nestabilitie to cut him out. I layered him atop a circle of green Prism cs cut using my round Quikcutz & then another scalloped circle of SU Real Red cs. I cut a piece of green cs, rounded the corners & pressed it using a CB Embossing folder. I hunted down some ribbon I bought in Michaels last year that perfectly matches the EF! I wrapped it around the embossed cs & attached it to my fawn colored base. 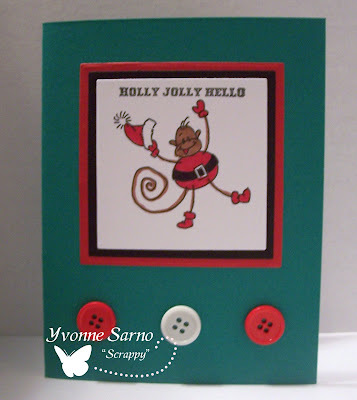 Finally I used some dimensionals to pop the layered Riley atop the card, & finished it with stacked coordinating buttons. One more for the girls! 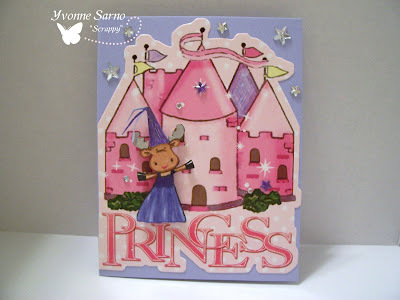 This is another card I made as an entry for Hanna Stamps Guest Designer call! 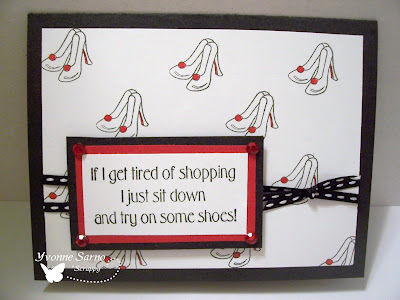 I love these shoes from the 'But I Need it' stamp set from HannaStamps! They made a great repeat design for my background! Then I blinged them up a bit with my Copics and red Spica pen. I added the twin row of black and white dashed ribbon, and after double matting the sentiment attached the whole thing to my black SU base. I added my cutomary sheet of white cs to write on inside the card, added the 4 ruby crystals, and tied on a scrap of ribbon to attack the double row together. I rather like the way it came out! How 'bout you? Today I am back at my stamp area happily stamping away at my latest project for my Hanna Bonanza for Hanna Stamps Guest Design call. My Project is two fold... I made a dog-theme scrapbook page and then as a thank you to each of my canine models, I made up gift bags to mail out for our canine friends! 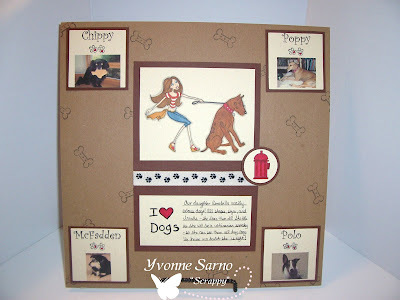 This scrapbook page features some of me and my daughter's favorite dogs whose mommies are SCS members. 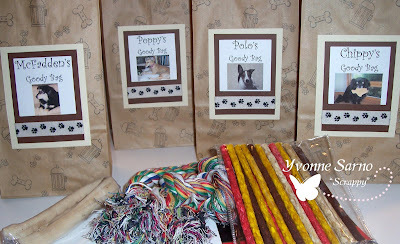 As a thank you to all of my 'canine models', I made up the matching doggy goody bags below! Thank you so much to my canine models & their moms for letting me feature your pups! For Rae Anne: "When we are going on the airplane to see Poppy?" For Joy: "There's my Joy Joy's Polo!!!! He's my friend!!" For Yoorah: "Is that my new dog? Can I keep him?" (and after I explain he's your's) "Can we ask Yoowah?" This is a close up of my Hanna from the scrapbook page. I decided that I wanted to give the dog the mottled fur colors that some pit bulls have. It took a bit of work using my Copics, Prismacolor Pencils, Gamsol, Pens, Inks, and chalk. It was alot of work, but I am happy with the result! "Our daughter Annabella really adores dogs! All shapes, sizes and breeds, she loves them all! She tells us she will be a Vetrinarian someday - so she can see them all day long. We have no doubt that she is right!" The little Goody Bags I made up for Poppy, Chippy, Polo and McFadden each feature their names & likenesses. They were printed, & double matted with paw printed twill ribbon. 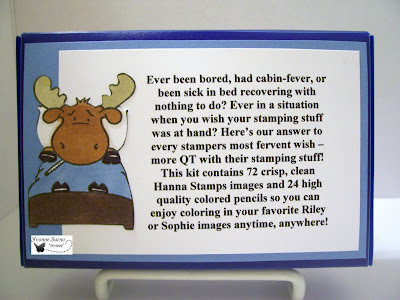 I attached them onto kraft colored paper lunch bags that I stamped using Hanna Stamps "My Best Friend" clear stamp set. I think these are great for Doggy Party Favors, Holiday, or small birthday gifts too, but as I mentioned, I just made them up as a Thank You gift! I'm sure you can think of a pal or two who would just love a little gift just like these! Hope you like 'em! I made this as another Hanna Stamps Guest Designer Entry. I picked the theme and colors, as a tribute to a very special friend - Laura Jean! Bucky girl, I look forward to seeing you in Ohio next month! 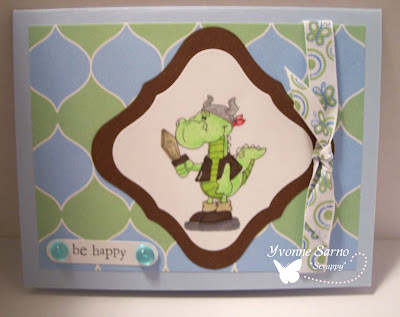 This is what I created tonight as my latest entry for Hanna Stamps Guest Designer call. The description in the second picture explains why I made this cute little kit up, so I'll just go over the basics. I started with a plastic index card holder I found for a dollar at CVS Pharmacy. I figured I'd fill it up with precut Riley images so it would be easy to send to a friend who was away and struck with cabin fever due to inclement weather. Then I realized it was perfect for me to take with me when I go into the hospital tommorrow for a minor procedure - so my mom would have something to do in the waiting room while she waited for news. I stamped six images of each of a dozen Rileys and Sophies and individually packaged them up. Then I added a package of 24 Prismacolor pencil samples someone recently gave me at a new art store I found. I added a descriptive label, as well as a colored image of Sick Riley on the back. I created the sentiment for the front on the computer, and cut it out. Then I paper pierced a decorative design around the edge and affixed it to the front. I think it made a nice, quick , easy, and thoughtful gift. I *might* just need to make me one of my own to leave in my purse or glove compartment too! Convenient to have while waiting in the carpool lane at the school, or waiting to be called for your appointments too! 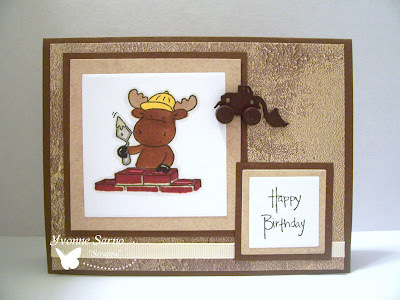 I made this card as an entry for Hanna Stamps Guest Designer call. I drew the background in to have her coming down an escalator in the mall. I was going for a 'Comic Book Art' kind of feel, but wanted vibrant colors & clean lines at the same time. I think I've achieved it! What do you think? I stamped my image using Memento Tuxedo Black ink on Georgia Pacific Stock, before coloring it with my Prismacolor Pencils. I drew in the background, & then got out my Gamsol (OMS) to smooth out & blend my coloring. I 'etched' in an 'edge' on the image, to make it look like a comic book frame before mounting it. I affixed it, the ribbon, and my computer generated sentiment to my SU Brilliant Blue cs base. Finally I edge the sentiment, & tied on a faux knot. 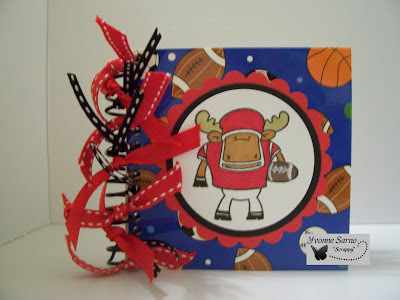 This tag I created today as part of my Hanna Bonanza! I'm entering it for Hanna Stamps Guest Designer call. It's also been recreated several more times to complete another spot in SuG's Tag Swap on Splitcoaststampers.com! Be sure to go check it out! I inked up Witch Riley with my Memento Tuxedo Black, and stamped him on Georgia Pacific stock before coloring him in with my Copics. I cut him out with my Nesties, and layered him. 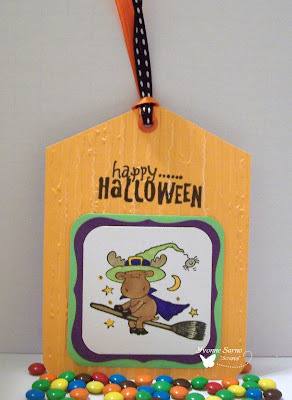 Then I made a tag template, stamped it, put it into an embossing folder before running it through my Cuttlebug. I affixed the stamped image to the tag, added the eyelet, and strung it with coordinating ribbon. 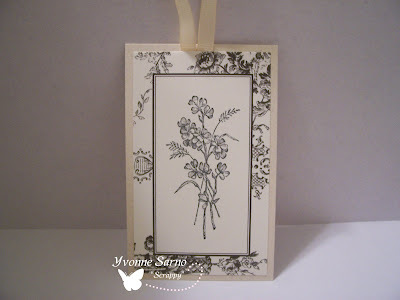 This tag was quick and simple to make despite looking more intricate. It was also incredibly fun to do because I LOVE Riley! 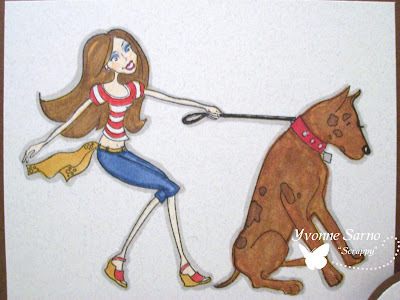 Stay tuned to see what I add tommorrow to my blog as I continue my Hanna Bonanza! I used a scrap of beige Wausau cs to use as the courtyard at the end of the bridge, and cut the bridge from Bazzill scraps. 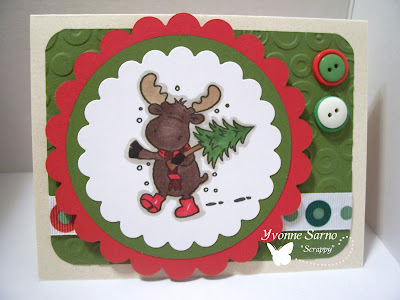 I used two different scraps of green Bazzil cs and distressed them to create the bushes and add depth to the card. I added the water below the bridge from another SU scrap, added a lilypad and punched the tiny waterlily (which is 3D, but it's difficult to see!) to place atop the water. I distressed the bottom of the bridge to make it appear as if the water was moving. The coif! I needed to create the elaborate Geisha 'do somehow! 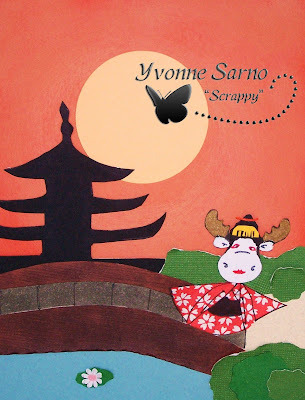 So I freehand cut her a 'wig', and added a golden comb and a ribbon to match her Kimono! I placed her upon the bridge, and I was finally satisfied with the resulting card! What do you think? My newest creation in my bid for a guest design spot for Hanna Stamps was a ton of fun to do! After the hectic day I had, I feel a bit like I've been somewhat of a 'speed racer' myself! 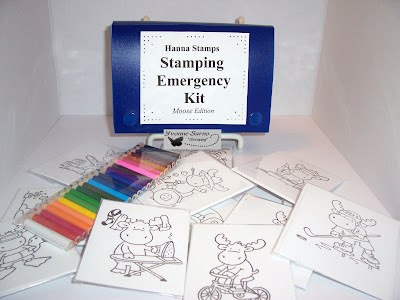 I hope you all and the folks at Hanna Stamps like 'Riley Earnhardt' too! 'Riley Earnhardt' has been racin' around in his little car trying to get all the errands Sophie sent him to do completed! 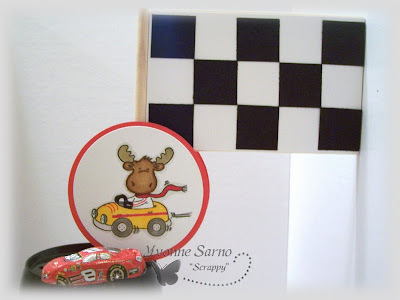 As an ode to racefans all around, including the husband of a friend of mine - I made this sweet Riley checkered flag and inserted into a chocolate filled commemorative travel mug as a little gift! I do hope he'll get a kick outta it! The flag is a wooden plant stake, which I quickly sanded before affixing the checkered background to it. I stamped Racecar Riley onto a piece of Neenah Solar White cardstock using Memento Tuxedo Black ink. I colored him in with my Copics - E35 (chamois), E37 (sepia), YG91 (putty), and Y28 (lionet gold). I colored his car in with Y17 (golden yellow), and added a R29 (lipstick red) pinstripe! Then I put anoter stripe of R29 on the arm of his tracksuit and colored in his scarf. The tires and headlight housings are in W5 (warm gray 5) while the rims and bumpers are W1 (warm gray 1), as is the shadow around him. I cut him out using my round QuickKutz dies, and used the next size up to cut two SU Real Red circles as well. I mounted the image on one of the red circles. I stacked my pop dots 3 high all around the backside of the image, and placed the flagstick between and centered it. Finally I put a thick bead of glue on the stick, took the sticky paper off the dimensional stacks and sandwiched the other red circle on it - effectively making Riley a flag -hugger! Since I've been noticing something wonky going on with some of my photos in the last week or so, I've enlisted the aid of the ever helpful Chris Byrd, and his beautiful wife, Joy (SCS ID: Daiseyfreak). Chris created the lovely new watermark you will be seeing attached to each of my submissions. Be sure to email me, or leave a PM for 'daiseyfreak' on Splitcoaststampers if you'd like any information on how to easily and affordably retain the rights to your own creations! It also adds a nice professional touch to your pictures too! I spent alot of my day out running around today, and didn't finish all of my tags -yet. However, after a long day out, I sat down with my hubby to watch the Stanley Cup finals between the Detroit Redwings and the Pittsburgh Penguins. If there is any sport I love (besides Michael Phelps swimming and other drool-worthy olympic events), watching hockey is my favorite! I love the excitement and the fast pace, but tonight I became a little distracted between periods. So you know I had to race over to my stamping area and ink up Hockey Riley to stamp so I could color him after we watched the game! I drew in the boards, the goal and the crease, as well as some of the ice markings, but didn't put the real ads on the boards as to not infringe on any copyrights. I think he came out pretty good! I woke up this morning with inspiration to work on a new Hanna idea! 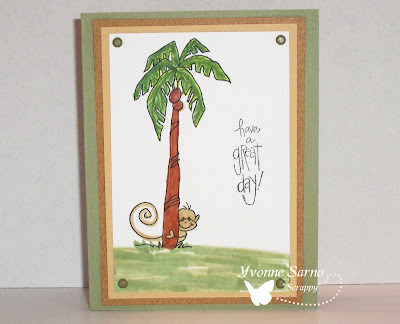 I was quick to run over to my stampin' space to sketch out my idea! It came out good enough to become another guest designer entry, rather than a rough draft! My 3 year old is calling it my 'Riley Insta-pration'! Here's a close-up of the coloring and detailed background on lil' Pirate Riley! I stamped Riley on Neenah Solar White cardstock and cut him out using my scalloped oval Nestabilities. I cut a larger scalloped oval of red SU cardstock to mount Riley on later as well as a sky blue rectangle to use for a tag base. I colored Riley in with my Copics, and then drew in the rigging and planks. I shaded the planks in so the would look like real wood, and highlighted the netting and the coil of rope behind Riley. Then I mounted the image onto the oval, and the tag base. I punched a hole and inserted an eyelet to put my ribbon through. Finally I rounded the corners on my tag base and highlighted it with my Peony (RV69) Copic. I was laying in my bed last night staring at the ceiling, trying to fall asleep for the third time when I finally decided to give up and get up to do something productive. I sat down in my stampin' area and suddenly felt super motivated and creative! I worked up three more swaps including a great new Riley card! 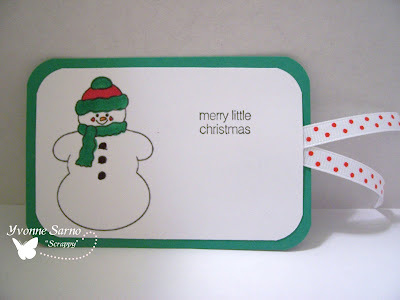 'Brickhousecards' on Splitcoaststampers is hosting several fun swaps including one featuring Snowman cards! Well who better than Riley to show us how it's done?! I stamped Snowman Riley on Georgia Pacific 110 pound cardstock at a shoebox swap in October, and decided his time had come! I dug out my Copics and colored him in and cut all around him to allow the background snowfall to show through. Then I got some textured blue cardstock scraps out and stamped them in a random pattern with some Inkadinkado snowflake stamps with white ink. I distressed two pieces of cards stock and triple mounted Riley before adding him to the Red SU cardstock base. I added the wooden tree to the card and stamped the simple words: 'Peace, Hope, Joy' onto the white cardstock by masking the SU stamp so I could place the words in the order I wanted. I love the way these cards turned out! What do you think? Last night I got online to try and post some of my newest Hanna cards to my blog. Unfortunately there was a storm warning - but in my eagerness to upload my pix, I ignored the thunder! My mother might have liked to say she 'told me so', except because I ignored her advice to turn off my computer, the storm zapped several of my files! One of the files included the one that contained several of my new Hanna card pix! :-( So bear with me tonight, while I endeavor to get them all up as soon as possible. I'm so glad I was able to recover a few pictures, most of my files, and that I didn't fry my new laptop! In the meantime, I hope you will check out this picture that was a 'survivor of the storm'! I made this card on a black SU cardstock base with several layers of cardstock atop it. I stamped the image of 'Mommie to Be Hanna ' on Neenah Solar White using Memento Tuxedo Black ink. I decided to keep the card very simple and let clean lines highlight her pregnant 'glow'. I colored her with my Copics, using Y17 (Golden Yellow), Y28 (Lionet Gold), E57 (Light Walnut), E00 (Skin White), R20 (Blush) & 100 (Black). I cut the image down, matted it onto a black SU cardstock scrap, and double matted that onto a scrap of Dark Sunshine Yellow cardstock by Worldwinpapers. I stamped the sentiment from SU onto a scrap I'd cut off the image, and double matted that in the same manner as the image. I used some black grosgrain ribbon and attached it along one side of a 3.75x5 " piece of white cardstock, and placed my main Hanna image alongside. I then affixed the sentiment near the bottom of the card, and attached it all to the base. Finally, I added the piece of white cardstock I usually glue inside my dark cardstock based cards. I spent a large portion of my day working on two Hanna cards of which I'm very pleased with! I LOVE the kind of seemless days when you are super productive and manage to get alot accomplished in short order! In fact, these are the types of days my 'Type A/EB HO' personality craves! Thank goodness both my ISP, and Blogge rcooperated with my efforts today! The picture really doesn't do the coloring justice, but I used several different mediums to create this scene. I stamped Granny Hanna, and 'But I Need it Hanna' on Neenah Solar white cs first before adding Grannies' rocker. I hand sketched the stoop under Granny and the porch planking. I added in the side walk and curb where our young shopper is walking. I colored Granny in using my Copics (B95, B12 for her dress and slippers; B45 for her handbag along with my white Galaxy pen; E00 and YG91 for her skin; E43, and W3 for her hair; BG10 for her socks; Galaxy white and Y28 were used on her cane.) The sidewalk was drawn in using my ultra fine sharpies as well as the planks on the porch and the stoop. I colored the concrete sidewalk W1, the curbside W5, and the bottom stoop W3. I used Y28, E57, & E77 for the planks. The rocker is done in Y28, while the cushion was done in B95, and the antimacassar in BG10 and BG01. Hanna herself is dressed in a lipstick red dress (R29), with matching espadrilles with Y28 soles. I used my Galaxy pen to accentuate the movement of her dress. I colored her hair using Copics, y28, and added lowlights with E57. I used E00 and E95 together for her skin tone. Her shopping bags were intended to replicate a few famous shops' , and I used BG01 for the light aqua bags, black and RV02 for the striped bags and YG23 for the lime green bag. All accented again with my Galaxy pen to simulate movement. Then came the even harder part! I watercolored the Sky and the greenery in the background using Staedler crayons, and Derwent Pencils. Once the painting dried, I used my prisma pencils and Gamsol to shade in some grass. I also dry penciled in details in the bushes for further depth. I punched out the sentiment using my word blurb punch, and popped it up with dimensionals. Finally, I added the poodle to the porch edge. WHEW! For my second card I decided to use Perfume Sophie. I stamped her on Neenah Solar white paper and drew in every detail of the scenery behind her from the rug, to the windows, to the wood paneling, to the 23 miniature bottles of parfum lining the shelves. I stamped with Memento Ink and drew in the scenery with my ultra fine sharpie. All of the coloring was done with Copic markers - in more colors than I can name here!! The sign is in french as Sophie is the proprietress of a Parisian Parfumerie! In English, it reads "Sophie Moose Perfumery"! I used Spica pens, & genstones, miniature crystals and rhinestones to bling out each & every bottle, as well as Sophies shoes, barrette, & earrings! After all, what's a gal without her bling? It's NOT my birthday of course, but I made this card as part of my Hanna Bonanza, and it really tickled my funny bone! It's day 2 of my Hanna Bonanza, and I've decided to feature Sophie, rather than a Riley card today. I really enjoyed Cindy's color challenge last night, so I used similar colors, but completely changed the layout! Bikini Sophie is rocking her orange and black striped bikini on the beach ! I used Bashful Blue cs and peach printed designer paper by Provocraft for a base. Then I used my scalloped oval nesties to cut blue and sand cs. I cut the ovals in half & inverted them to make it look like a horizon. I stamped Sophie on Neenah Solar White CS, & colored her with my Copics using E57, W3, 100, YR16, and E57. Then I carefully cut her out, & pasted her onto the horizon. I outlined her shadow using Copics' W3. I stamped a sentiment from StampingBella on Neenah Solar White cs, & used my EK Success, blurb punch to create the her comment. I added some stacked Primas, & an orange brad to the lower left hand corner. Finally I affixed the sentiment & dotted the edges with an extra fine tip Sharpie to add definition. 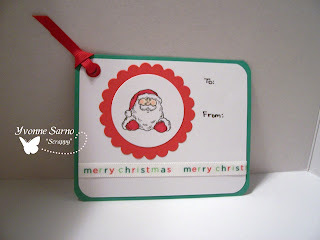 I decided to quickly work up another cute, little card after I spied Viv's new Non-traditional color Christmas card swap on Splitcoast stampers. I dug through my DP stash and found just the right paper and knew instantly what colors I wanted to use! I even stamped an apropro sentiment inside the card too! Hope you like it! There are some amazingly talented stampers joining everyday! Why not join them? One of my favorite stamp companies- Hannastamps has a design team call! In typical Scrappy fashion, I've decide to celebrate with my own 'Hanna Bonanza'! 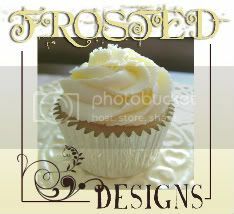 Each time I post to my blog from now until June 20th, I will feature a new card or project spotlighting a stamp made by Hanna Stamps! Of course, I also have my own insane amount of swap obligations to do too! So in order to accomplish such an incredible feat, I will be creating a challenge card or 'Bonanza card', & then using it for a swap or donating it for my next charity swap! So without further ado...Meet 'Fins'! I used Fins Riley to do the June Release Challenge #1. 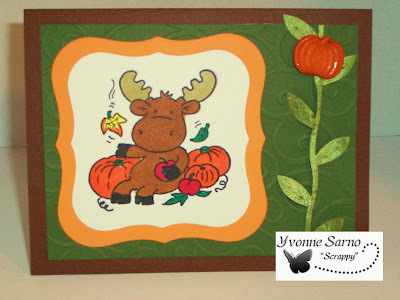 Cindy Haffner challenged us to use Apricot, Blue, & one other color (in this case - Kraft) to create a card. I stamped Fins on Neenah Solar White cs using my Memento ink. I used Copics in Lionet Gold (Y28), Flesh Pink (E95), & Aqua Blue (BG01) to color, before triple mounting him. The closest color I had to apricot was this peach-y cs, which I ran through my Cuttlebug using the swiss dots folder. I also ran the blue through the CB using the swirls folder. I used fibres from EK Success to tie the button on, & added dimensionals, before mounting it all on kraft cs. I have also created several more of this card to use for my friend Cheryl's (DJ!) 'Lifes a Beach' Swap on Splitcoaststampers. Since I almost invariably make 8 cards for most swaps, the extra two that won't be used for the swap will be donated to my next charity swap. I am still working on the details for my next charity swap, so be sure to keep checking my blog to see if you'd like to join me! In the meantime, don't forget to check out 'DJ's' swap on Splitcoaststampers: http://www.splitcoaststampers.com/forums/showthread.php?t=435833 , as well as www.hannastamps.com to find Fins Riley, and other awesome stamps! 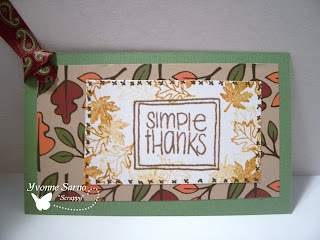 This week I completed my MFT Charity Swap on Splitcoaststampers. I love to do volunteer work, and was raised to serve others in our Christian faith. Sometimes we can become so bogged down and saddened by the things we see everyday - the poor economy, the crimes of utter desperation, that we miss the truly beautiful things in life. My swap was a 3+1 swap, in which I donated every single one of the cards I would normally have kept as swap hostess. My swappers had the option of recieving a swap return or donating their return cards to the charity as well. I also got several PMs from people who did not want to join the swap, but wanted to donate cards anyways! I was heartened by the beautiful cards that poured in and truly in awe of the generousity of swappers who sent in extra cards, simply donated cards, and asked for nothing at all in return! It was amazing to feel my heart swell with happiness over the sweetness and goodness that we often miss in these tough times! Kudos to all of you who participated for reaffirming my faith in human kindness. PS: I will be going to the Duke Cancer Center at Raleigh, NC later next week, as I have recieved 54 more cards to donate to the hospital! Your outpouring of generosity has not abated, and on behalf of the recipients, I thank you all again!